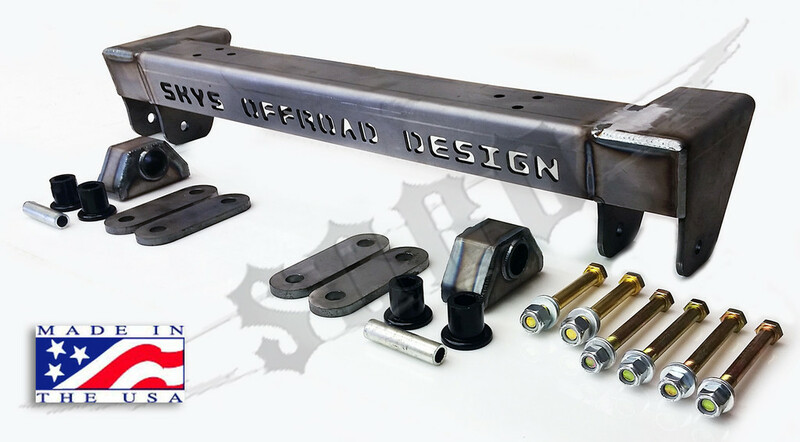 Sky's Off Road Design Chevy S-10 Blazer/Pickup solid axle conversion leaf hanger kit. Fits all Chevy and GMC S10 models, 2wd, 4wd and ZR2. Check out our optional rear lift shackles in the add-ons tab above! We also have shock hoop kits available! Check out the Almighty Dime build using this kit. A basic idea on how we install these kits, The best way to do this is to install the springs on the axle, then the hangers on the springs, then set the vehicle on the hangers and figure where you want you axle center line to be. Then tack hangers in place and set weight on the springs. If this is the location you want, then fully weld. If it needs moved, now is the time. ***This kit is fairly universal being weld on. The key is the rear shackle hangers, you will need to get a angle iron plate to weld inside the frame to move the point where they mount inboard.